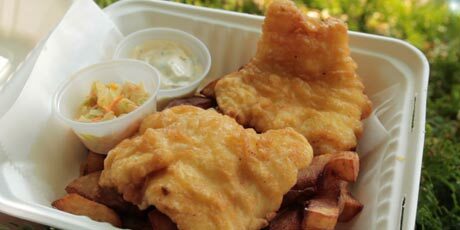 Traditional fish and chips. You'll love making your own tartar sauce. Courtesy of James King of the Frying Scotsman. 1. Dice the gherkins into small squares, chop the capers and parsley finely and mix together in a bowl. Add the lemon juice and mayonnaise to all the ingredients and place into the fridge to cool. 2. Mix the vinegar, baking powder, flour, turmeric, salt and pepper in a bowl. Slowly add the water and beat with a whisk until the batter is smooth and the proper consistency. Dredge fish in flour then dip into the batter. Fry at 350 degrees Fahrenheit until golden brown (about 5 minutes). 3. Peel the potatoes then cut into large potato strips. Fry the french fries at 350 degrees Fahrenheit until golden brown (7 to 10 minutes). Salt and pepper to taste. 4. Serve fish and chips hot with tartar sauce and any other condiments you like, such as HP sauce, ketchup or the like.